The first lighthouse was built in 1857 to direct the sailing ships of the day to safe haven at Lloyd Harbor The station consisted of an eleven room wooden building next to a square brick lighthouse tower. The tower was 34-foot tall from its base to its focal plane of the light. A fifth-order Fresnel lens showed a fixed white light from 48-feet above the water. In the early 1900's, with Huntington's commercial development and ships changing from sail to propeller driven, the safety of Lloyd's Harbor became less necessary. Where the Lloyd Harbor Light served only Lloyd harbor, it was determined that a new lighthouse could be built to serve the needs of both Lloyd Harbor and Huntington Harbor. The current Huntington Harbor Lighthouse, pictured, was completed in 1912. The reinforced concrete crib is 26-foot by 30 foot and 16-foot high. It was built on shore, then towed to the site, where it was filled with water to sink it. Riprap was then used to fill the bottom, along with concrete to fill the pockets. A concrete pier was built on top of the crib, which supports the dwelling and tower, also made of concrete. Its original lighting was provided by a fifth-order Fresnel lens, lit with kerosene, then electricity, showing a fixed red light visible for 8 nautical miles. A 1,000 pound fog bell was also installed at the site. The current light, automated in 1967, is a 300mm lens, flashing its white light every six seconds. 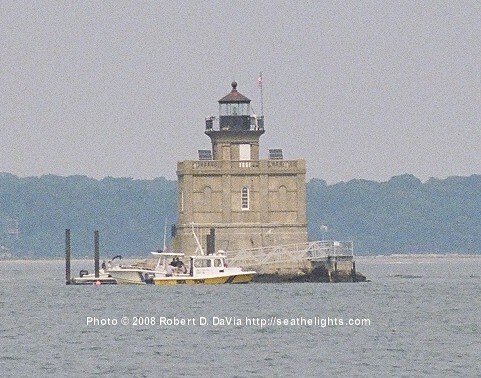 In 1985, the Save Huntington's Lighthouse, Inc., was formed to help save and preserve the lighthouse. The year prior, the federal government decided to demolish it, citing its condition and cost of repair. The grassroots effort led the successful bid to save the light. Since renamed the Huntington Lighthouse Preservation Society, they have been gradually restoring the building inside and out. Unfortunately, the original Lloyd Harbor Lighthouse was not so lucky. On November 12, 1947, it was completely destroyed by fire.